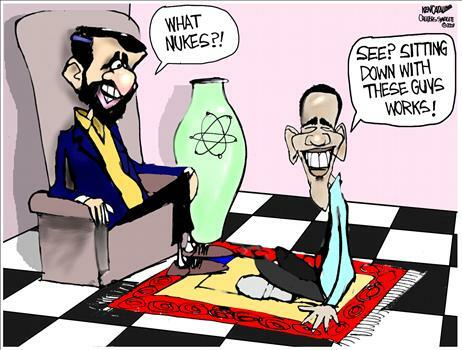 A bad nuke deal with Iran seems likely to be approved by the P5+1 negotiators under Obama’s guidance. It will be disastrous. However, if it is signed and Obama tries to implement it, there will be little if anything the Congress can do about it, even if it wants to, until January of 2017 — which will likely be too late. Even if it is not too late in 2017 it may or may not happen, depending on who is our President and who controls Congress. I have written extensively about the Iran Scam and Obama’s untruths and obfuscations concerning it. I did so most recently in a semi-satirical article titled To get a nuke deal with Iran Obama and the Islamist world demonize Israel. Please read at least the Iran Scam article; to repeat here the points made there would make this post far too long. Sen. Lindsey Graham (R-S.C.) took to the Senate floor on Thursday to ask for unanimous consent to schedule a vote on a bill that would give Congress final approval over any deal, or else reinstate tough sanctions on Iran. Democratic Sen. Chris Murphy (Conn.) quickly rejected the request, arguing that scheduling a vote on the deal would be “premature at this point.” He said it would “send a fairly chilling message” that U.S. officials at the table with Iran did not have full authority to negotiate an agreement. But when Republicans take control of the Senate, they could move to pass that bill, or push legislation from Senate Foreign Relations Chairman Bob Menendez (D-N.J.) and Sen. Mark Kirk (R-Ill.) which would reinstate sanctions if Iran violates any deal. Their bill also pledges military support for Israel if it decides to strike Iran’s nuclear facilities, which it has threatened to do. The president has already threatened to veto the legislation, but doing so would be politically risky. The bill already enjoys the support of 60 senators, including 16 Democrats, and there is sweeping support for a similar bill in the House. A deal that’s not supported by Congress or seen as weak could also hurt the 2016 Democratic presidential nominee, especially if it fails to prevent Iran from obtaining nuclear weapons capabilities. Obama has displayed utter disdain for the Congress and constitutional processes. He will most likely continue to do so, in spades, when the new Republican dominated Congress is seated in January. The perceptions of the author of the linked article are excessively optimistic, as suggested below. As a lame duck President, Obama has little if anything to lose. Any impact on the 2016 elections of a bad nuke deal with Iran may well not be of substantial importance to Obama and, to the extent that it is, He will probably use His ample opportunities to “Gruber” – to obfuscate and lie effectively — about the facts and their consequences substantially to diminish any adverse impact of His actions on those elections. There’s more here about Obama, Gruber and Grubering, which Obama continues to do with at least modest success. As the Obama administration did from the beginning and continues to do with the ObamaCare debacle, it will “Gruber” the facts and consequences of a nuke deal in presenting it to the Congress and the public. Should the next Congress nevertheless pass a bill which He does not like, He will veto it as He has promised to do. To override a veto requires the affirmative vote of two thirds of both houses under Article 1, Section 7, of the Constitution. Even in the unlikely event that an Obama veto is overridden, there is no reason to assume that He will apply the new law as Congress intends. Congressional attempts to defund administration efforts to implement an agreement with Iran seem unlikely to work: multiple other governmental functions, facially unconnected with the matter, would still have to be funded. The parameters of their funding would have to be extraordinarily tight to avoid fund shifting. Even then, the Obama administration has shown itself to be extraordinarily adept at fund shifting regardless of congressional intent as reflected in seemingly clear statutory language. Even were U.S. Sanctions – the only sanctions on which the Congress has any significant impact – to be reinstated, their enforcement would be up to the Obama administration, not the Congress. The administration would likely refuse to enforce them, as it has multiple times with other Federal laws of which Obama does not approve. Were the Congress or other interested parties to succeed in getting judicial review, the process would be long and the results uncertain until the Supreme Court granted and exercised review. That process could easily take years. In addition, it remains questionable whether the Congress, its representatives or anyone else would even have standing to initiate judicial action. Chairman of the Iranian parliament’s National Security and Foreign Policy Commission Alaeddin Boroujerdi said imposing sanctions against Tehran is an already failed policy. The article claiming that a Republican controlled Congress can dash Obama’s hopes for a nuke deal with Iran also suggests that it can pledge “military support for Israel if it decides to strike Iran’s nuclear facilities.” It can certainly do that. However, just as the Obama administration has refused to enforce or simply ignored aspects of other legislation, it can refuse to enforce or simply ignore that pledge as well. With the exception of a possible — but far from certain — prompt and effective Israeli military attack on Iran’s nuke facilities, the mess has gone too far for effective action. Israel, which rarely brags about what she can or intends to do, has quite properly been rather coy about the resources she can use against Iran. So have possible allies in the Middle East concerning such help as they may be willing and able to provide. However, Israel probably has substantial electromagnetic pulse (EMP) capabilities which could be used to damage Iran’s command and control facilities substantially. The attack could be carried out using a nuclear warhead detonated after launch by one of Israel’s Jericho III missiles at high-altitude over north central Iran. EMP affects computers and other electronics and would disrupt critical infrastructure that relies on electronics and electricity, such as communications, transportation, and other networks. The burst would create “no blast or radiation effects on the ground,” the article stated. “Coupled with cyber-attacks, Iranians would not know it happened except for a massive shutdown of the electric power grid, oil refineries, and a transportation gridlock,” the article said. Iran more than likely also has substantial EMP capabilities, so unless Israel uses her own first, and sooner than Iran anticipates, it will be too late. Sanctions may well have prompted Iran to agree to discuss a nuke deal with P5+1. However, the negotiations have done little beyond diminishing those sanctions to the point of ineffectiveness, while giving Iran ample time, incentive and opportunity to continue research on, and implementation of, its nuke plans. If preventing Iran from continuing its development of nukes had been the objective, or even a substantial objective, Iran’s military facilities and advances on nuke development would have been central to any “interim agreement.” Far from being central, they were not even peripheral. From the beginning, as contended here, here, here and elsewhere, the “Grubered” interim agreement and White House Summary of it have given Iran every possible advantage and shielded its military facilities from effective scrutiny. Some elections have consequences. Obama’s 2012 election had very unfortunate consequences. However, the 2014 elections will probably have few if any beneficial consequences with respect to the Iran Scam and come January 2017 it will probably be too late should effective action then be attempted. If, as seems likely, a nuke deal with Iran, good for Iran and bad for the most of the rest of world is signed, it now appears that the only possible effective solution with a decent chance of success will be prompt military action by Israel, in conjunction with her temporary and therefore uncertain allies in the Middle East which are opposed to Iranian nukes. I am well aware of the possible adverse consequences of such a strike, including extreme actions that Russia and her allies might take in response. However, the possibility of mutually assured destruction worked in the past and should work again. Russia, et al, unlike Iran, are not compelled by a barbaric religion to bring to the world Armageddon and the arrival of the Twelfth Imam. They want power, not death. If they and their enemies are obliterated, their current power and hopes of increasing it would be destroyed along with them. This entry was posted in Atomic bomb, Congress, Conservatives, Constitution, Elections, Executive Order, Foreign policy, Iran, Israel, Jonathan Gruber, Khamenei, Kiking the can down the road, Law and Order, Leftists, Legislation, Lies, Middle East, Netanyahu, Nuclear weapons, Obama, P5+1, Peace in our time, Politics, Rouhani, Sanctions, Twelfth Imam, United States, Veto and tagged Congress, Foreign policy, Iran, Israel, Jonathan Gruber, Nukes, obama, P5+1, politics, Twelfth Imam, Veto. Bookmark the permalink. It’s entirely possible that Iran could develop and maintain a number of nuclear warheads without anyone having proof of their existence. The normal means of determining the presence of nuclear weapons is to observe tests. Despite a number of rumors of testing, Israel has never conducted a confirmed test, and it’s less a fact and more an assumption that they are nuclear capable. By that reasoning, Iran may already have nuclear warheads. Delivery systems, of course, are another matter. Iran is admittedly a state driven by an irrational religion (an oxymoron if there ever was one). However, they have an instinct to survive, which isn’t refuted by the fact that the elites are more than willing to encourage a few underclass Muslims blow themselves up from time to time. They know full well that if they use a nuclear weapons for any purpose, including EMP, they’re going to suffer severe retaliation. I don’t think they’ll do it unless they face a worse scenario that threatens their existence. What, then, should the U.S. sans Obama, Israel and others concerned about a nuclear Iran do about it?